It's been six months since the LG Optimus G was released and it seems we have already come across its successor. The Optimus G2, as it is being called, was spotted getting its Bluetooth certification at the Bluetooth SIG and also in AnTuTu benchmark scores. The benchmark scores reveal three variants of the G2, the F320K, F320L and F340L. The F320K has a 1.5GHz processor and runs on Android 4.1.2. The other two run on a 2GHz processor, which is most likely the Qualcomm Snapdragon 800 as it is the only processor that can clock that high as of now. The last two models run on Android 4.2.2 instead. 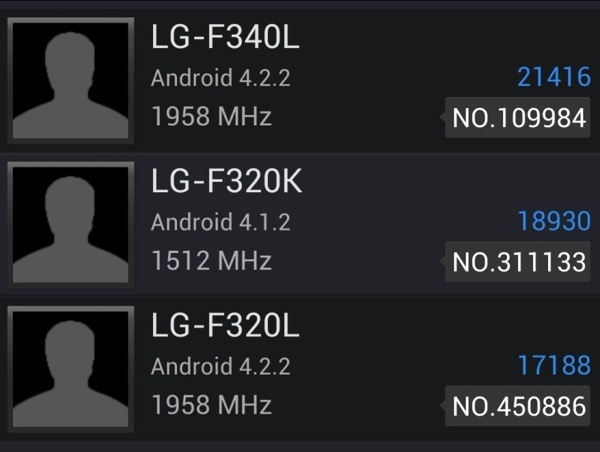 Interestingly, the F320L, despite the 2GHz processor, scores lower than the F320K in AnTuTu. Other than the processor, it is being said that the G2 will have a 5.0-inch, 1920 x 1080 resolution display, 13 megapixel rear camera and 2.1 megapixel front camera. Hopefully, more information about this device will surface soon. LG lousy hardware and software, nothing to be excited about. despite d snapdragon 800 and 2 GHZ proposed to carry it still score below d once with snapdragon 600 with 1.7 GHZ, wat is wrong LG. LG Optimus G2 confirmed for Q3 by my LG rep yesterday coming to us to all carriers!